What’s Going On? Check Out WPengineer.com! First of all, Happy Thanksgiving to all of you who had a big chunk of turkey on their plate! And second – everybody who likes to support our new project, can skip some parts and check out the end of this post. What’s going on here? As you can see, not much on this blog lately. Not that I have a writers block, not at all, I have tons of interesting posts on my list. But other projects keep me very busy right now. But this will get to a normal level in December and gives me more time to write on my blog. A new design is nothing worth without good and new content, right? In a previous post I mentioned that I’m working an a very exciting project which reflects pretty much my professional interestings. The project is called WPengineer.com and talks about tips and tricks, news and improvements for WordPress. The system of my choice, which you can use for building Blogs or extensive Content Management Systems. A tool with endless possibilities to build your website. To get to know all the possibilities of WordPress, understand and finally use, we started WPengineer.com end of August. For beginners, advanced users and pros. After just 4 month a pretty successfull and fun project. My partners for this website are the genuis Micha of dynamicinternet.eu and Frank, the fantastisc writer and developer of bueltge.de, which is very famous in the German language scene. It is an honor to work with them together. We are hoping to have many readers, which grabb our knowledge with pleasure and use our ideas, solutions and possibilities in their blog. But, as it is in real life, there is alway a give and receive. That’s why we asking our readers for little support today. Since a week we are participating for the coolest blog powered by WordPress. Amongst all famous and great WordPress blogs in the english speaking scene, we really love to, and sometimes use for insparation, we are currently on a sensationally 4th place. A great effort, but with your support there might be more possible! 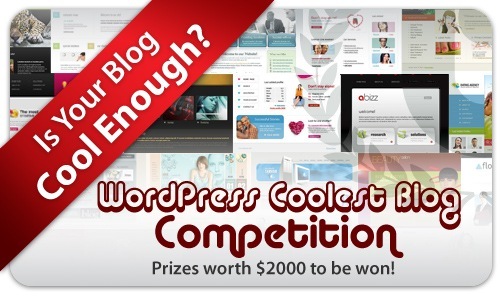 Until 1st of December it is possible to vote for the coolest blog powered by WordPress. We would appreciate a lot if you go ahead and vote for WPengineer.com. Just one click and you are done. And as I said, in December I will have some great posts published and probably will let you know on what other major project I’m currently working on. Of course, it’s something about WordPress. So don’t run away. Oh, I almost forgot, my next post will be a video tutorial probably, so you can listen to my terrible voice the first time. I would like to appreciate your team work in building the new updates about wordpress themes and styles..I think you had great support from your partners that you can achieve your goal in a short span..